EASTON TOWN CENTER October 2018 • SHOPPING CENTER BUSINESS • 77 O ver the years, Columbus, Ohio- based developer Steiner + As- sociates has built a portfolio packed with strong performing retail and mixed-use destinations. Steiner projects have helped to define and redefine a gen- eration of groundbreaking commercial destinations. There is perhaps no greater testament to that legacy than the fact that a project that is nearly two decades old continues to evolve, expand and occupy a seemingly permanent place among the highest-earn- ing mixed-use centers in the nation. The project is Easton Town Center, the iconic Columbus development that came onto the scene in 1999 with an inspired and ultimately transformative formula for success. Co-developed by Steiner + As- sociates, The Georgetown Company and Limited Brands, the density, connectiv- ity, and rich, immersive environment of Easton — perfectly captured with a street grid layout and evocative small-town mid- dle-America theme — conveys the impres- sion of a town that has evolved naturally over time, and helps establish a memora- ble and engaging sense of place. Design innovations aside, one critical ingredient to Easton's sustained success over the past two decades has been a resolve to not rest on its laurels. 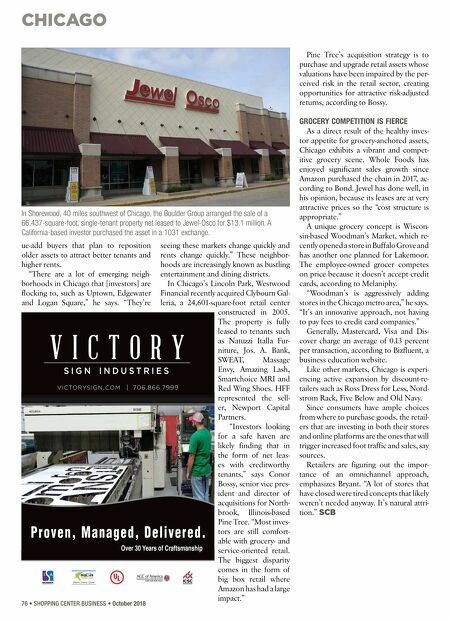 The center continues to add new pieces to the merchandising puzzle, to integrate new experiences and programming into the project, and to secure the latest and greatest retail, dining and entertainment concepts. Easton opened a second phase in 2001 and added a significant expansion with the 54-acre, 583,000-square-foot power village, Easton Gateway, in 2014. Over the years, the addition of new hos- pitality options, significant office space, adjacent residential, and a long list of prominent and popular new brands has made it possible for Easton to evolve and expand in exciting new ways. 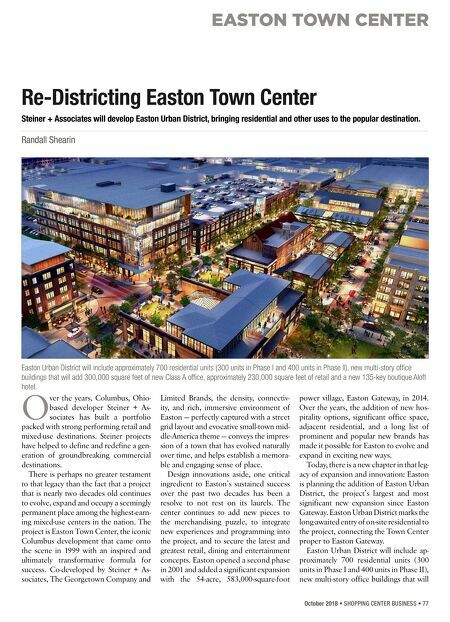 Today, there is a new chapter in that leg- acy of expansion and innovation: Easton is planning the addition of Easton Urban District, the project's largest and most significant new expansion since Easton Gateway. Easton Urban District marks the long-awaited entry of on-site residential to the project, connecting the Town Center proper to Easton Gateway. Easton Urban District will include ap- proximately 700 residential units (300 units in Phase I and 400 units in Phase II), new multi-story office buildings that will Re-Districting Easton Town Center Steiner + Associates will develop Easton Urban District, bringing residential and other uses to the popular destination. Randall Shearin Easton Urban District will include approximately 700 residential units (300 units in Phase I and 400 units in Phase II), new multi-story office buildings that will add 300,000 square feet of new Class A office, approximately 230,000 square feet of retail and a new 135-key boutique Aloft hotel.